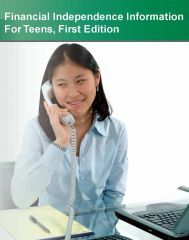 Financial Independence Information for Teens, 1st Ed. Financial Independence Information for Teens offers information on expanding teen financial literacy and transitioning into adulthood. It discusses career-planning, creating and living within a budget, and planning for the future in order to meet a teen’s financial and educational goals. Overviews of money-management tools and other financial information are offered as additional resources. Part One: Determining When a Teen Is Ready to Be Independent begins with a brief insight on the emotional and physical factors determining whether a teen is ready to be financially independent, the barriers they face, and how parents can guide and ensure their success. It also provides information on emancipation laws, how teens with disabilities can experience financial independence, and how they can assess themselves to know they are ready to embark on the journey to financial independence. Part Two: Teen Employment deals with the process of getting employment. It begins with an overview of legal requirements for getting employed, laws pertaining to child labour, statistics of teens in the nation’s workforce, the types of employment available for teens, including internships, opportunities, and hazards related to the workplace. It also offers information on tools essential for job search such as resume building, job search strategies, workplace ethics, balancing work and life, and concludes with rights and safety aspects for teen workers. Part Three: Creating and Living Within a Budget focuses on budgeting, saving, investments, financial knowledge, taxes and tax benefits for education. It also presents basic facts about banks and banking, electronic banking, managing money, and how to work with financial professionals. Part Four: Living on Your Own focuses on housing options for teens who prefer to lead an independent life, besides legal issues related to renting, maintenance, and sharing responsibilities with roommates. Part Five: Planning for the Future dwells upon future financial and educational goals, career decisions, credit scores and its importance, keys to getting higher earning potential, and options for earning online. Part Six: Additional Information offers resources for financial independence.